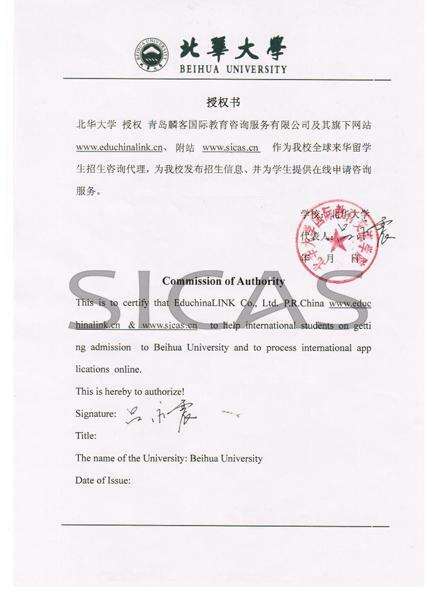 Beihua University is recognized by WHO and the graduates of MBBS program are eligible to take the Medical Licensing Examinations held by the medical councils in different countries such as MCI, PMDC, USMLE, HPCSA, SCHS etc. Fourth Year: Surgery Medicine, Ophthalmology, Gynecology and Obstetrics, Pediatrics, ENT, Dermatology, Infectious Disease. The internship will be arranged in the last year and the duration is one year (at least 48 weeks). See more details in Internship and Career. Notes: The University provides free airport pick-up service for international students from Jilin Railway Station or Changchun Longjia International Airport. MBBS degree: On completing the requirements of the teaching program and passing the graduation examinations successfully, international medical undergraduates will be granted a graduation certificate and conferred a medical degree by Beihua University, if they meet the degree regulations of the university. The English copy of the degree will state MBBS (Bachelor of Medicine and Bachelor of Surgery). Students holding the diploma of senior high school with a good command of English.